Is Google’s hot new social network Google+ a serious “threat” to Facebook? Or Twitter? In the short or long term, I don’t think so. But, Google+ will certainly make Facebook, in particular, more agile and determined to continue improving its array of products. I wrote this blog post for those people who don’t “get” Google+ yet, who are not yet on Google+, and/or who might be in a place of wait-and-see. After a few short weeks, I’m convinced Google+ will become a *major* player in the social networking arena. (Stay tuned for my post shortly after this one which will be a tutorial with marked up screenshots: 10 Simple Steps To Getting Started On Google+). Also, those businesses that want to get a head start must pay close attention to what’s happening on this rapidly growing new social network. I joined Google+ on June 29, the day after the site launched, thanks to an invite from a friend. Since then, I’ve been actively using the site daily, studying member behavior, and reading as many articles as possible about the platform. (My own blog post is certainly long overdue; I’ve had many posts about Google+ sitting in draft for the past few weeks, but have been so busy on all these social sites along with completing my next book!) Well over 14,000 Google+ members have added me to their circles. (There’s no limit to how many peeps can circle you; but the max you can add to circles is 5,000). Yes, the growth is unprecedented. It’s fascinating to watch the incredibly rapid growth of Google+, the depth of sharing, the availability of heads of companies, the web celebs, the nuggets (and the noise! ), and the amazing accessibility and responsiveness of the Google+ team. Not to mention that the user interface is so cool! 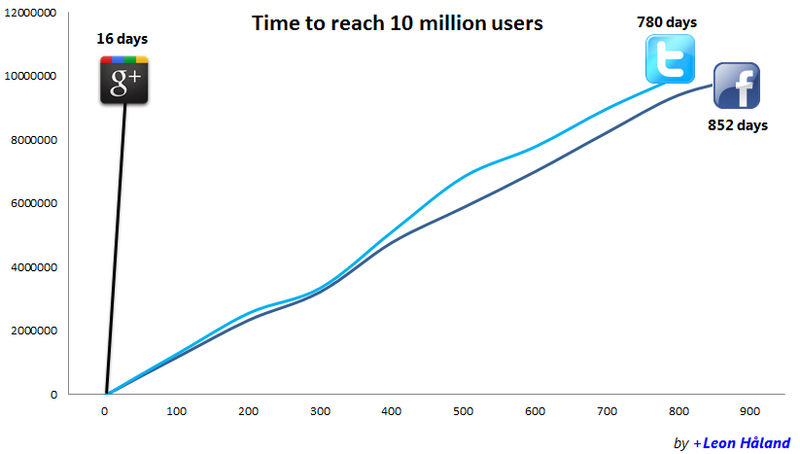 As you can see by the graph below, it took Google+ only 16 days to reach 10 million users. Whereas, it took Facebook 852 days and Twitter 780 days to reach the same milestone. Amazing! Of course, Google+ has the advantage of (finally) entering the social world now that this arena is more established by Facebook and Twitter. Not to mention the pre-existing large userbase Google already has from its array of excellent products. As much as I love Facebook, I have to say that I’m extremely excited about Google+. In fact, I haven’t felt this excited about a social network since I first joined Facebook in May 2007. Facebook will always be my “first love,” and the site is certainly here to stay. I plan to continue building out and maintaining an active presence with my Facebook personal profile, my Facebook page, and on Twitter. To me, it’s a both/and world. It’s taken me many years to build up and nurture my communities on Facebook and Twitter; I’m not about to abandon them because a shiny new toy arrived on the scene. Obviously, there are only so many available hours in the day for social networks, though, and now my intent is to simply divide up the same time between these platforms. (And, I’m not here to tell you what’s right and wrong; individuals and business will need to reassess their own approach to social networking now and find what works for them). I understand games are coming to Google+; I do hope Google tries hard to differentiate and we don’t start seeing “farm” and “fish” updates pouring into the stream! Some major advantages Google+ has over Facebook include integrating with all other Google products, specifically Gmail and search/SERPs (search engine results pages). Google+ was designed to PLUS all other Google products. Unless and until Facebook bites the bullet and launches a killer search engine – it’s certainly sorely missing! Yes, I know Bing has some Facebook integration. But, wouldn’t it be great to easily search fan pages (your own and others) at the click of a button? There is such a plethora of content on our pages and it would be awesome to have a way to easily archive and search this valuable content (you know, like a blog?!). However, for now, as a social network, Facebook has the upper hand with its long-established user behavior, length of session time, amount of game players, social ads, and business pages. What about Google+ business profiles? Regards the business side, it’ll be interesting to see how everything shifts when Google+ starts offering business profiles. Currently, Google+ only allows profiles in the name of individuals; business profiles are coming soon. Just like we manage our communities on both Twitter and Facebook and our own blogs, (and for many businesses, also LinkedIn and YouTube and other platforms), at some point (soon!) I see that we will be “forced” to also manage a business community on Google+ to cater to those customers and prospects who simply prefer this network. Plus, you’ll need to include Google+ when managing and monitoring the reputation of your business/brand. There’s much that businesses ought to be doing right now to get a headstart though; I’ll cover this in a forthcoming blog post Don’t Wait For Google+ Business Profiles – 7 Actions To Do Now. The energy is fresh and most people are excited to be on the platform. User response is faster and more thoughtful compare to some other networks. So far, the amount of spam and junk is very light and manageable. If someone posts more frequently than you prefer, just uncircle them. 😉 Or, focus on curating content from select circles. (My circle strategy is in progress; I change it recently per this post). On posts and comments, we can easily add *bold* and _italics_ (-and strikeout-) for emphasis. (I keep going to do this on Facebook – oops! I hope Facebook integrates the formatting feature at some point). We can also easily edit posts and comments. (On Facebook, you can edit posts made with a photo or video at any time. But status updates can’t be edited. With comments, you have about a ten second window to edit comments: click the “x” as if to delete and the text field opens back up). I love that we can tag anyone in our conversations whether they’re in our circles or not. I hope we can do the same when business profiles arrive, I’m sure we will. Facebook makes it challenging to keep a conversation going and alert fans in particular know that you’ve responded. You can easily join a Hangout with people like Michael Dell and chat directly with him! Tom Anderson, founder and former CEO of MySpace, is super active on G+ and posts a ton of amazing, thought-provoking posts. Another cool feature is Sparks – where you can search and easily find content on any subject or categories of subjects and instantly share with your network. I have only just dabbled with this feature so far and have not found it to be that useful yet. Google will be adding improvements. In addition, I understand the mobile G+ app on the Android smartphone rocks. I’m an iPhone gal; the G+ iPhone app is somewhat rudimentary and slow… but a better one is coming. I’m enjoying reading articles about potential interoperability: the option to interact with our friends in their preferred network on our chosen network. (At the rate Facebook is booting out friend list scrapers – and banning Google+ ads – I may question its desire to be open. Still, it’s a good protection for users to be able to choose what happens to his/her email address/contact info). You’ll need a Gmail account. [UPDATE Aug 11, 2011: You don’t have to have a Gmail account per se; but you do need a Google account which you can create with any email address. I do recommend a Gmail account, though!] Then you’ll need an invite to Google+. With the recent release of invitation links, you may find plenty here. (I’m sure Google+ will open the floodgates shortly anyway and do away with the invitation process). Fill out your bio, links, and add a profile photo to your new Google+ profile. Remember, you need to use your real name for your profile, not a business name. (Note: if you previously had a Google Profile, this is now your Google+ Profile). Then get familiar with the circles: they work similarly to Facebook friend lists insofar as you can view your stream of content filtered by these lists and you can publish content to specific lists. Begin to create a few circles. You can find people to follow here and here. Feel free to circle me. Think about content curation as one approach to G+; create a circle with select individuals that post on topics of interest to you. When you view your stream, this makes it easy to skim and share content with your own followers. (I’m choosing to share 99% of my content publicly vs. only posting to certain circles). If the stream from your circles gets unwieldy, don’t be afraid to either uncircle individuals or simply place in a “Following” circle. Then, stay focused on the streams of your smaller circles, not your main stream. PLUS, see Pluserati – Guy Kawasaki‘s top Google+ users featured on Alltop.com! G+Me Chrome Extension – allows you to collapse/expand posts and comments (a must have!) and a few more bells ‘n’ whistles. Replies and More – adds Reply to Author to all posts and comments. Also allows easy sharing of content on Twitter and Facebook. Usability Boost – adds several visual features to enhance readability, among other nifty features. Plus One Anything – adds a nifty +1 button to your browser toolbar for plussing any website whether they have the +1 button or not. Any webpage you +1 shows up under the “+1” tab of your Google+ profile. Google Plus Widget – place a widget on your blog/site to display your follower (people who have circled you) count and realtime rotating updates. …more than anything, I think, you need to remain flexible and pay attention to how the Internet is evolving. There’s no one-size fits all strategy, and you’ll probably want to modify your own strategy as it suits your needs. ~Tom Anderson (former President, founder and first friend on MySpace) excerpted from this guest post on TechCrunch. Remember, Facebook is still home to 750 million active users, half log on daily for an average session time of 55 minutes. Well over 250 million users access Facebook via their smartphones and these mobile users are twice as active as web users. There is a massive captive audience on Facebook and if you’re serious about taking your business or brand to the next level, you owe it to yourself to truly understand and tap into all that Facebook offers. Come join me for the Facebook Success Summit 2011! It’s entirely virtual, no travel or hotels. Learn from 19 Facebook marketing experts as they share exactly how you can maximize your marketing on the world’s #1 social network. Featured presenters include Guy Kawasaki, Robert Scoble, Jesse Stay, Paul Dunay, Mike Stelzner, myself and many others! Tickets are currently half-price, but you can also try before you buy with a free online class lead by yours truly: Facebook News Feed Optimization: How to Dramatically Increase Your Visibility and Engagement.